I have to admit, I usually shy away from 'popular' books. I don't like being told what to like, or not like, based on a consensus of strangers. 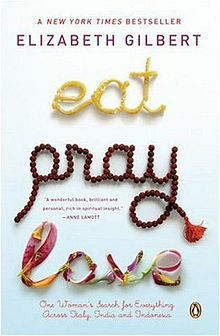 But I finally read Eat Pray Love by Elizabeth Gilbert as my 27th book this year, to satisfy the 19th category on my reading challenge list - a book based on a true story. And I'm really glad I finally did. I loved the author's approach of both telling about her past and her experiences, as well as what she learned, in a 'take it or leave it' sort of tone. She wasn't promising anyone else a better life, perspective, or experience from reading her book, only her own assessment of it. If it works for you, great. If not, oh well. At the beginning of the book, I felt I was learning more from her spiritual insights, but that makes sense - India was the more spiritually intended leg of her journey. By the end, I really wanted to know what would happen next during her stay in Indonesia. I'm not sure if that says more about my place in the universe or her book. I don't re-read very many books, but I'm at the point just a week later where I'd don't think I'd mind reviewing some of the earlier lessons, and see why Italy didn't make as much of an impression on me as the other parts of her journey. If you've read this book too (and I was under the impression that a lot of people have), what was your favorite part? I haven't read it yet but will put it on my list. Did you read The Art of Tidying Up yet? I haven't read this book yet, but it does seem like most of my literary friends have -- and they all have an opinion about it. Though I haven't yet read the book, I have seen the movie based on it. Even in watching the film, there wasn't much to take away from the Italy portion. It seemed like India was a turning point in her journey, which makes sense since that was the spiritual leg of her eat, pray, love approach to travel. I LOVE reading popular books because I want to know what the hype is about. I fell in LOVE with this book many years ago. I love how she found herself and totally changed her life.